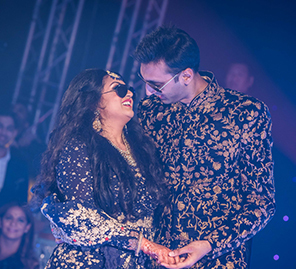 The beautiful #ROKAY nuptials of Rohit and Karishma in Bangkok, Thailand included multiple activities packed into three days, and saw guests enjoying champagne in their 'chappals' (slippers) and the conveniences of the stunning locations by the riverside. "Rohit and I met more than a decade ago through a mutual friend. I was at her home for a sleepover and first 'met' ohit via webcam. My first impression was that he was a cute loser and he thought the same of me! But I was the persistent one - I asked for his email and contact number, and over time we eventually met up every now and then for coffee and walks. I call Rohit 'Ro' and that's how our wedding got the hashtag of #ROKAY." "I currently work in PR in Hong Kong and have had the privilege of working closely with top brands from FMCG, F&B, fashion to airlines. Rohit, who has a passion for men’s wear, works in his family business of over 30 years focusing on bespoke tailoring and quality craftsmanship for men. " "Ro planned an extremely elaborate proposal... He convinced my two close friends to plan a faux girls trip to Taiwan in order to block my dates from work and keep me distracted for about three to four months - all along actually planning my proposal! The morning when we to fly to Taiwan, my friends showed up at my place with a letter only to find out that we were not flying to Taiwan that day but instead, being the gamer that I am, I would be scavenger hunting for clues all day. I spent the day collecting clues from loved ones from one checkpoint to the next across Hong Kong, at all the places that resonated with our relationship of the past decade. The last clue was a ticket to Manila and then to the island of Boracay where we had our first trip together with friends. Then I found the last clue placed on my bed with my favorite chocolates which said “Dine with me at the cliff of Shangri-La Boracay”. We did have hurdles though, flights were delayed, the sunset dinner/ proposal went dark and the rain didn’t stop – but none of it mattered! Ro met me at the top of the cliff, with a personal chef at our service, shisha made by him, bubblies and some of our favorite music. He showed me a video of how he had put together of the entire planning process. Then he got down on his knees and asked me to marry him. How could I say no to that?" "We always knew we would get married in Thailand, and kicked off our venue scouting at Phuket followed by Bangkok. We consulted our Bangkok-based wedding planners about the pros and cons of both destinations - and aspects such as distance of hotels from airport (this was important as we had guests attending from long distances), efficiency, convenience, hotel outlook, hospitality standards, F&B quality... we finally came to a decision and chose Anantara Riverside Bangkok Resort and AVANI Riverside Bangkok Hotel." "Compared to other horror stories that I’ve heard about wedding planning disasters, ours was quite smooth. The first thing we did was hire a wedding planner who I instantly connected with – Shanaya Celebrations who were like a loving family team. They had input in all areas of planning, from picking a hotel, décor look and feel, makeup artist, entertainment, down to 'pooja' items, wedding materials and on-site family management. All this made it easier for Ro and I to make decisions. We would plan bi-weekly Skype calls for updates and catch up with frequent calls closer to the wedding." "Throughout the wedding we wanted friends and family to simply Feel the Love that Ro and I have for each other. 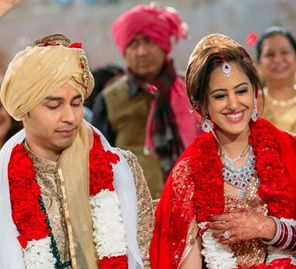 Our three-day wedding included functions like Ro’s 'Janya', 'Meet & Greet Welcome Dinner', 'Ghari Pooja', 'Chappals & Champagne Mehndi', 'Jewel Nights Engagement' and Sangeet, 'Bridal Baraat', 'Groom’s Baraat', 'Always & Forever Riverside Pheras' and 'The Royal Affair Reception'. We envisioned each occasion to have specific shades of color rather than themes. With the 'Janya' on the lawn in the evening, we opted for a starry night setting that was lit with brilliant views of the glittering city scape." "The welcome dinner was casual and down to earth. The 'Ghari Poojas' vibe was kept bright and fresh with the same design in both the groom’s and bride’s rooms, but in different colours." 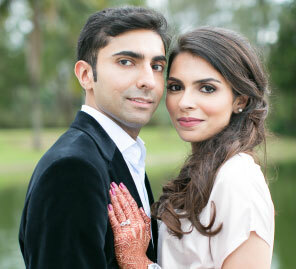 "My mehndi was held in my bridal suite lounge and had a warm and cosy feel. My friend and family were requested to come in 'chappals' (slippers), and we kept them full and merry with champagne, and Bangkok's best samosas and pakoras that were especially catered for the event." "The colorful sangeet night focused on decor in jewel tones in a contemporary design featuring a long light bulb filled entrance, an LED light bar, ceiling lamps, stage design and cushion covers." "For our 'baraats' (wedding procession), both Ro and I were escorted to the pheras in a tuk-tuk parade and drumming. The mandap reflected the colors of my wedding dress - white, gold, magenta, baby pink and dashes of dark purple covered in flowers." "Our reception in the evening was all about the elegance of rose gold and red... The wishing tree was incorporated into the photo backdrop at the entrance by our talented decorators and again, another LED light bar acted as an extension of the stage at the other end of the ballroom. We had hired Instaroid to print real-time hashtag #ROKAY photos for those who didn’t want to wait in line for photos with the wedding photographers." "My welcome dinner, mehndi and sangeet ensembles were designer-made from Indore, Mumbai and New Delhi. My wedding dress was from the Frontier Bazaar Bridal Collection 2016/2017 in New Delhi, and my reception outfit from MNM Couture. My entire jewellery set for the sangeet was from Frontier Bazaar's Bridal Collection in New Delhi, while the jewellery for the pheras was from Madanlal Chhaganlal Diamond Collection. Ro’s sangeet and wedding outfits were from Kora in Mumbai, while his welcome dinner and reception ensembles were from Rocky’s Fashion in Hong Kong." "Our wedding invites were designed by @prettygilded, a team of two based in Hyderabad - their talent, creativity, originality and quality was evident in every design they executed. Besides the wedding itself, I always looked forward to glamming up with Simran Takkar and her fabulous team. They dolled me up, gave me advice and instructions on diet for better skin and made me feel the most beautiful." "If you are planning a destination wedding, make sure you hire a wedding planner first who should ideally be based in the same location if you are having a destination wedding. Also, breathe and be patient with everything and everyone because it all works out eventually!" Venues: Anantara Riverside Bangkok Resort & AVANI Riverside Bangkok Hotel."